Sister Mary Francis of the Infant Jesus, O.C.D. We would like to share some reflections on our dear Sister. One thing that truly shaped the character of Sister Mary Francis was her strong Irish Catholic upbringing. She was educated in a private boarding school run by the I.H.M.’s—thanks to whom she never lost her manners. Even as she became more and more disabled, Sister Mary Francis always remained a lady. Religious vocations to Carmel were not unknown in her home, as two of her mother’s cousins were Carmelites in the Philadelphia Carmel. Sister often spoke of her fond memories of driving to the Carmel every Sunday for Benediction. Her tender and trusting love for Our Blessed Mother was begun at home, where a vigil candle always burned before the statue of Our Lady on the second floor; and was reinforced by her boarding school years. The prayer which she learned at age fourteen while at Villa Maria Academy, “The Night is Falling Dear Mother”, remained the last prayer which she said before going to bed each night up until the day she died. Sister Mary Francis had always desired to become a nurse, but her acquisition of a full tuition scholarship to Immaculata College and her father’s opposition forced her to abandon that dream. She kept up her interest while in Carmel, obtaining some Nurses’ Assistant manuals, which aided her in her role as Infirmarian. Another of Sister’s hallmarks was her great ability to form, value and keep friendships. She and her bosom friend Jane Malone were like sisters growing up: “Jane was Mother and Dad’s other daughter,” Sister would always say. She also kept up with many of her grade school, high school and college friends—even given the limits imposed by Carmel’s cloister. And when she was Prioress for twenty-three years here in Loretto, her circle of friends expanded to include many priests and benefactors of our Carmel. She took a real interest in them all as people, and in their families and their struggles. God gifted Sister Mary Francis with many administrative abilities, as well as with a motherly heart. We consider her as having re-founded Loretto Carmel after some difficult years. 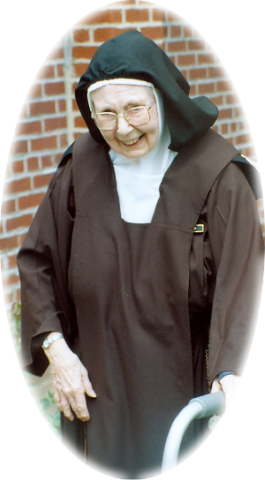 Her gentle yet strong personal example of faithful Carmelite living did more to change hearts than many lectures ever could. As Sister began to age, and her infirmities became more pronounced, it was her deep-seated practice of obedience that aided her in accepting assistance. All our Infirmarian had to say was “the doctor wants me to give you this medicine” and she would comply with the request. If, in response to her question, “What is this for?” the reply “Oh, it’s good for what ails you,” was given, it would inevitably be met with the humorous repartee, “And what you don’t have, it gives you!” There were many times that her keen sense of humor would come to her aid (and ours!) in relieving the tension of a difficult moment. And these moments would become more frequent as a result of the two or three strokes of varying intensity which Sister suffered over the last nine years of her life. The last purifying graces that God allowed, and which she cooperated with, enabled her to “run with giant steps” towards her Bridegroom. It was truly amazing to see how He purified her and how she responded, always leaning on Our Lady—who came to be near her “for dear Jesus’ sake” when her “soul on eternity’s shore” did awake… on Saturday, October 13th, 2012, the 95th anniversary of the last of the Fatima apparitions.